Architect-designer Hector Guimard earned recognition for his architectural optimism but garnered additional acclaim for his designs intended to occupy the spaces that he created. Working during the end of the nineteenth and early twenteieth centuries in the organic language of Art Nouveau, Guimard approached his designs as part of a larger artistic whole, a Gesamtkunstwerk, to dispel subjective hierarchy often found in art and design. His unifying designs for lived-in spaces were aimed at the middle classes to better their environment as part of a socially conscious design movement. During this period, Paris was dim and cramped with less than optimal living situations. The French designers and artists who sympathized with the working class aimed to make life a more pleasurable every day experience. Through an approach of total design, Guimard, along with other avant-garde artists of the time, created spaces and objects with a utopian ethos that were praised by some while rejected by others. Guimard established a very individual visual language that can typically be recognized by its globular, swirling vegetal forms with an obvious nod to nature. The fluidity of Art Nouveau openly embraced modernity and the acceleration the ever-changing cultural climate while it also brought an anthropomorphic aspect back into design. This silvered cast brass frame is not unlike Guimard’s architectural frames used for windows, doors and gates seen in constructions like Le Castel Beranger (1894-98), his Paris Metro stations (c. 1900) and Hotel Mezzara (1910). The frame exudes a tension in its pliant visual effect, appearing almost as if it is clay in the process of being pulled and molded. The natural curvature of the frame with its intertwining and spiraling waves brings a softness to the solid object. This visual language appears throughout Guimard’s work. He produced harmonious schemes in which each element worked in step with one another. 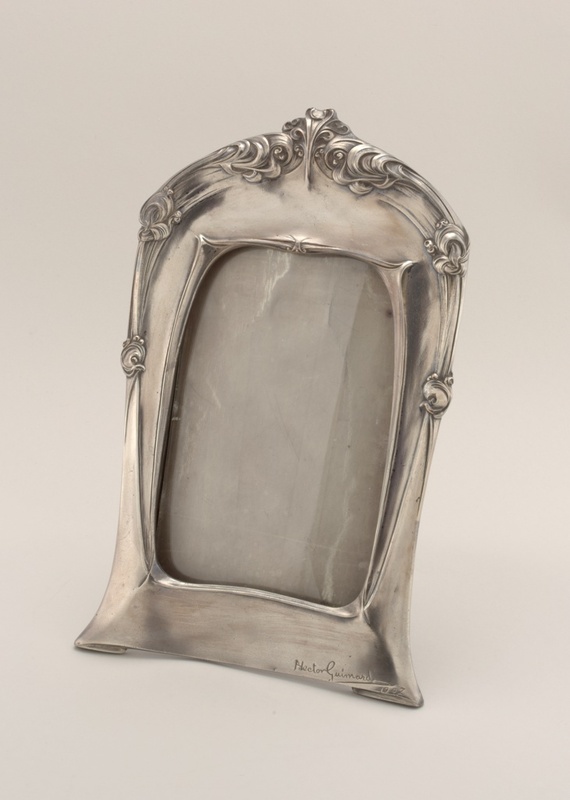 The Cooper Hewitt’s collection acquired this frame as a gift from Guimard’s wife fourteen years after his death in New York City. Guimard championed modernity while also recognizing the importance of history as an educational tool for the world’s artists and designers to follow. As a man known for his insistent self-promotion, it is not unreasonable to conclude that Adeline Guimard may have been continuing to promote the legacy of her late husband’s work. Emily Birzak is a graduate student at Parsons studying History of Design and Curatorial Studies. Currently, her interests lie in fashion and its position in business and the arts. Frame (France), 1907; Hector Guimard (French, 1867–1942); Silvered cast brass, plate glass; Gift of Mme. Hector Guimard, 1956-76-6-a/c.